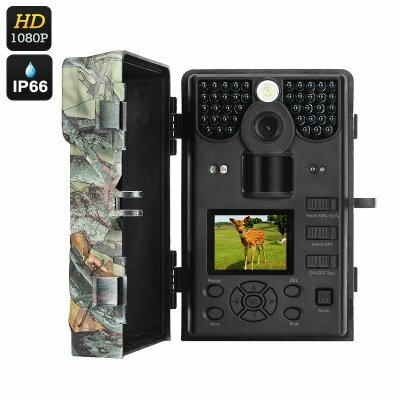 Successfully Added HD Hunting Camera - 12MP, 1080P, IP66, 2 Inch Display, 4X Digital Zoom, 6 Months Standby, Powerful Night Vision to your Shopping Cart. This hunting camera is a great tool for nature observation that will let you see wildlife in their natural habitat and without disturbing their regular patterns. With 1080P video resolution, 12MP, night vision, motion sensor and a 2 inch TFT display, it comes with everything you need for observing animals or stalking prey. This 1080P hunting camera will offer you clear video feedback night and day. It comes with powerful night vision (42 IR LEDs, up to 23 meters) and can last for up to 6 months in standby. 12MP photo resolution ensures that you get clear and crisp snapshots of the monitored area. The 2.0 inch TFT display offers convenient playback and lets you make sure that the camera is covering the area you need. The 1080P game camera comes with motion detection and you will even be able to adjust PIR sensitivity, depending on the size of game you are expecting. You will have plenty of options when it comes to powering the hunting camera: from 8 x AA Batteries or 12V DC to a solar panel or 12V power bank or storage battery (not included). Thanks to IP66 rating of the protective casing, the game cam can easily handle the elements and will be able to serve you long and well whether rain or shine. Another great thing about the 1080P hunting camera is that the trail cam can be fully removed from its protective case — so you won’t have to bother with dragging the case along or taking it down if you need to change batteries, remove the SD card or review the footage at home. The HD Hunting Camera comes with a 12 months warranty, brought to you by the leader in electronic devices as well as wholesale hunting cameras..